Today. I was going to cut my run short when I saw some unreal clouds settling behind the Willis Tower. I have never seen a cloud like this one in the city and I knew it would make for a great picture. 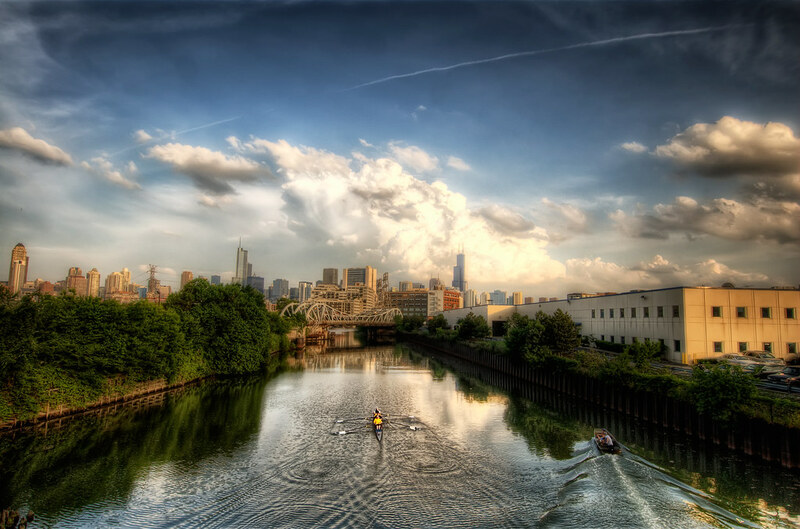 This was taken from the Division st. bridge near the Division and Halsted intersection. Unfortunately, Division is a busy street and I was getting a ton of tripod shake so this took me forever to get a good shot, but it just so happened that the best one I got was as these kayakers were passing underneath. I usually don't promote anything commercial on this blog... actually I usually don't promote anything. But, Justin Kern from the TheWindyPixel.com is running an HDR workshop on June 12th, and June 19th here in Chicago. The workshop is an all day event, and will cover not only composition, and actually taking pictures, but after all the good light is gone, he will go through his workflow for post processing! I am extremely excited about this because Justin is one of my favorite photographers and I have already learned a ton from him, so I can only imagine how much more I will learn from this workshop. You can get The Rest of the Juicy Details Here. Some nice clouds settling over the Chicago Skyline. Wow. Seriously. Words can't even describe the beauty of this shot. It literally takes my breath away every time I look at it. I wanna say that it's absolutely magical but that simply would not be enough to convey the way I feel about your art. It moves me. You move me. Beautiful shot. Those would be rowers in a four person rowing shell. I am the stroke oar wearing yellow. Our coach is in the launch on the right hand side of the shot. But what makes the European hunks so commitment-happy—a phase that typically takes many New York men until their 40s to reach? ... Maybe it’s the surplus of E.U. benefits—free day care, health care, and tax benefits even for unmarried couples—that makes the possibility of contented ménage a more realistic proposition at an earlier age.